The video puts emphasis on Aly Raisman, the US Olympic athlete and other victims of abuse at the hands of gymnastics doctor Larry Nassar. He has received hundreds of years in prison for his crimes. 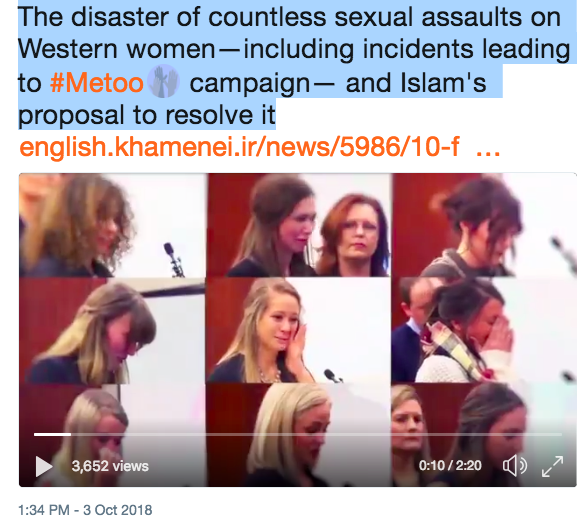 But in the video Khamenei uses the victims as one example of why “by introducing hijab, Islam has shut the door on a path that would lead toward such deviation.” This is victim-shaming at its worst. The implication is if that if only the athletes, some of them young victims in their teens had covered their hair then they would not have been targeted by the doctor? 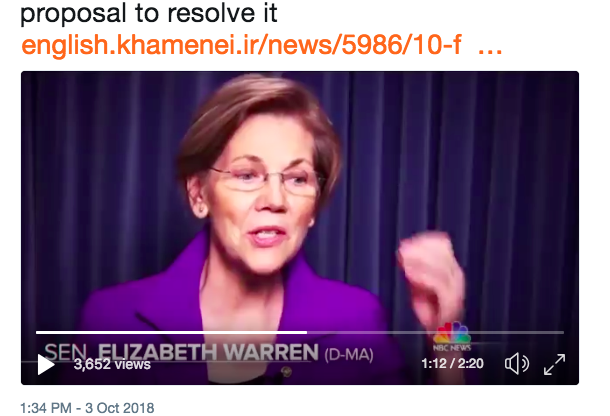 This is shameful exploitation of victims to advance Khamenei’s cause. It implies that the victims are the problem and how they dressed is the problem. 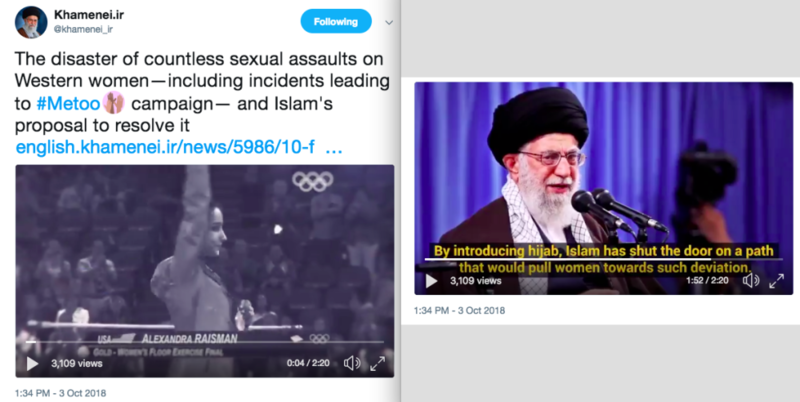 The bizarre and failed attempt to victim-shame shows how out of touch the Tehran regime is but it also shows its desperate attempt to try to exploit and tap into western causes. 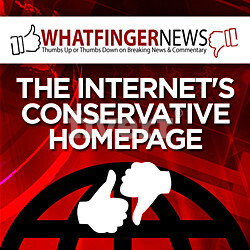 It wants to channel Me Too and other issues in the West and turn them into a “win” for Tehran. 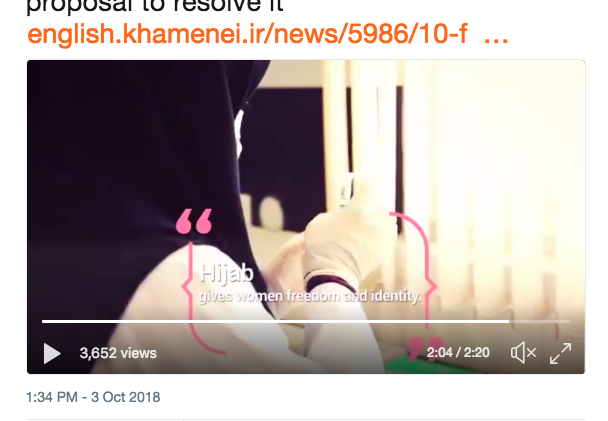 Hopefully this video shows the reality of the regime that is not moderate but far-right and which seeks to shame victims and use their images and their abuse to advance Tehran’s interests. It also illustrates the worldview of the regime, which sees every victim as the problem. Why were young teenage athletes used as an example of stopping “this deviation.” Notice the image of the perpetrator doctor is not used. In the view of this regime it is the victims that need “hijab” and “modesty”, not the perpetrators. And this is a window into this worldview. In trying to tap into the awakening in the West that is taking place confronting sexual harassment, the Tehran regime has betrayed its own mansplaining worldview.